Don’t Feel Like Cooking? Gobble, Gobble Your Thanksgiving Meal at a Fine D.C. Restaurant on Nov. 25! Turkey Day. It’s a-comin’. Are you ready? I’m getting my menu together and preparing to feed eight hungry adults. I’ve cooked for 11 in the past, and while not every dish was piping hot when it reached the table, the meal was pretty damn tasty. We all had a great time…until Grandma fell off of her chair. She wasn’t even schnockered. And she recovered quickly. But that’s another story for another time. Thanksgiving is about good company and a good, hot meal. So if you can’t be home this holiday – or if the kitchen is being renovated, say – and cook for your brood, several Washington restaurants offer Thanksgiving meals. I’m not talking about that shady hotel offering a buffet or that salty Safeway turkey dinner. 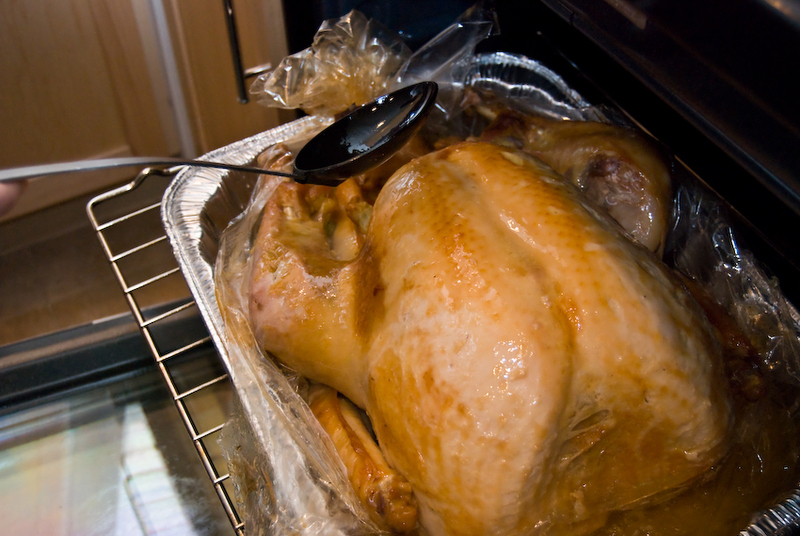 (Oh, how I wish I could block those hideous Thanksgiving meals out of my memory for good.) I’m talking about high-end joints, like 701 Restaurant on Pennsylvania Avenue in Northwest Washington. 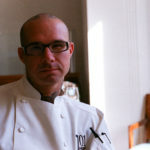 I recently met with 701’s new chef, Ed Witt (pictured above). Drawing on his years of experience in some of New York’s finest kitchens, Witt creates “modern American, simple, local, seasonal” dishes at the 20-year-old restaurant. On Thursday, November 25, experience Witt’s love for seasonal ingredients at one of the Thanksgiving Day seatings, held between 11 a.m. to 8 p.m.
“When seasons roll around, I get ideas and remember dishes I haven’t cooked in years,” he said. 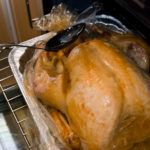 On this year’s menu, diners can expect Crisp Duck Confit with frisee salad, Medijool dates and Fuyu persimmon; Eco-Friendly Turkey with roasted breast meat, leg Ballotine, mashed potatoes, stuffing and giblet gravy; Eco-Friendly Suckling Pig with house made sausage stuffing, celery root and Savoy cabbage; and even a vegetarian dish of Ricotta Ravioli with sage brown butter, autumn squash and walnuts. At $45 prix-fixe and $20 for children 10 years and under, it’s a reasonable price to pay for what promises to be an excellent meal. If you can’t get to 701 for Thanksgiving, I recommend visiting another time for lunch or dinner. DISCLOSURE: I was treated to dinner there recently and enjoyed a delightful rabbit appetizer and the bronzino entrée. I want to go back, too, particularly for Witt’s tobacco braised pork belly dish served with sautéed savoy cabbage. For reservations at 701 this Thanksgiving, call (202) 393-0701. 1789 Restaurant – Serving from 12 Noon to 9 p.m., order from the seasonal a la carte menu or choose the three-course menu for $50, which includes a choice of pumpkin soup or bitter greens and citrus salad, turkey with all of the trimmings, and a full selection of desserts with by coffee or tea. Valet parking is complimentary. Call (202) 965-1789 for availability. Clyde’s – Ten locations will serve a traditional dinner with turkey, sweet potato, stuffing, cranberry sauce, you get the idea. Visit Clyde’s website for more information. Zola Wine & Kitchen – Take your Turkey Day meal to go, choosing from range and brown sugar glazed sweet potatoes, oyster dressing, sage and rosemary roasted rutabagas pureed with gorgonzola cream, pre-cooked herbed roasted turkey and more. Call (202) 639-9463 or visit www.zolawinekitchen.com for more information. My, what fresh ice cream – it’s getting salty with me! Oh man, that ricotta ravioli sounds amazing. I discovered brown butter with crispy sage as a sauce for butternut squash ravioli. Well, really, brown butter is the cure-all for whatever ails you. Yum.